Also serving communities of Irmo, Chapin. There are 8 Memory Care Facilities in the Lexington area, with 2 in Lexington and 6 nearby. The average cost of memory care in Lexington is $3,540 per month. This is lower than the national median of $4,650. To help you with your search, browse the 5 reviews below for memory care facilities in Lexington. Better rated regions include West Columbia with an average rating of 4.6 out of 5 stars. Caring.com has helped thousands of families find high-quality senior care. To speak with one of our Family Advisors about memory care options and costs in Lexington, call (855) 863-8283. Lexington is a rapidly growing suburb of Columbia whose low living costs and warm weather make it an attractive retirement spot for seniors — nearly 12 percent of the population. The town has two memory care facilities for residents with Alzheimer's disease and other forms of dementia. The state capital of Columbia, a 15-minute drive away on I-20, offers five additional choices. In South Carolina, memory care facilities are housed within assisted living homes in secure, self-contained spaces known as Alzheimer's special care units (SCUs) or programs. For seniors who despise cold weather and can stand some summer heat and humidity, Lexington offers an ideal climate. Snow is rare — about 1 inch per year on average. The town gets 222 days of annual sunshine and 75 days that fall within the comfortable range of 70 to 80 degrees, giving memory care residents ample opportunity to enjoy supervised time outdoors. The overall cost of living in Lexington is 4 percent lower than the national average, and housing costs are 14 percent less than in a typical U.S. city. This makes Lexington an attractive destination not only for budget-conscious seniors needing memory care but also for their family members wanting to relocate to be near them. 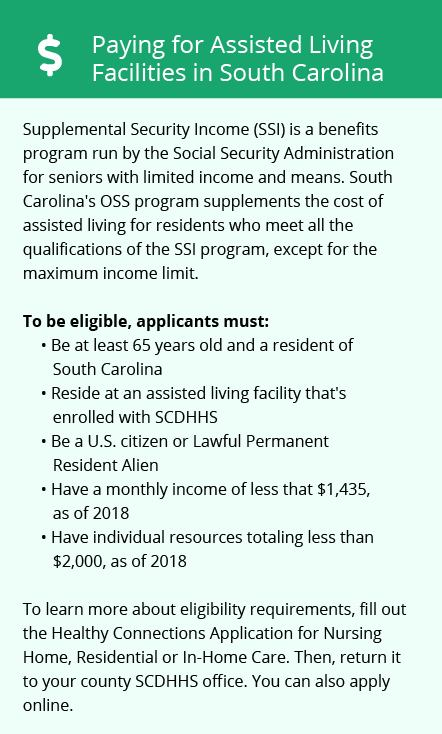 With no tax on Social Security retirement benefits, a $15,000 deduction for seniors receiving other forms of retirement income and some of the nation's lowest property taxes, South Carolina is popular with seniors. The state's low tax burden leaves more money for memory care residents to afford top-notch care. Lexington's violent crime rate is lower than the national average. Although the town's rate of property crime is slightly elevated, seniors living in memory care facilities shouldn't worry as features such as guards, cameras and secure doors should keep their valuables safe. Memory Care costs in Lexington start around $3,540 per month on average, while the nationwide average cost of memory care is $4,798 per month. It’s important to note that memory care rates in Lexington and the surrounding suburbs can vary widely based on factors such as location, the level of care needed, apartment size and the types of amenities offered at each community. Lexington and the surrounding area are home to numerous government agencies and non-profit organizations offering help for seniors searching for or currently residing in an assisted living community. These organizations can also provide assistance in a number of other eldercare services such as geriatric care management, elder law advice, estate planning, finding home care and health and wellness programs. To see a list of free memory care resources in Lexington, please visit our Assisted Living in South Carolina page. 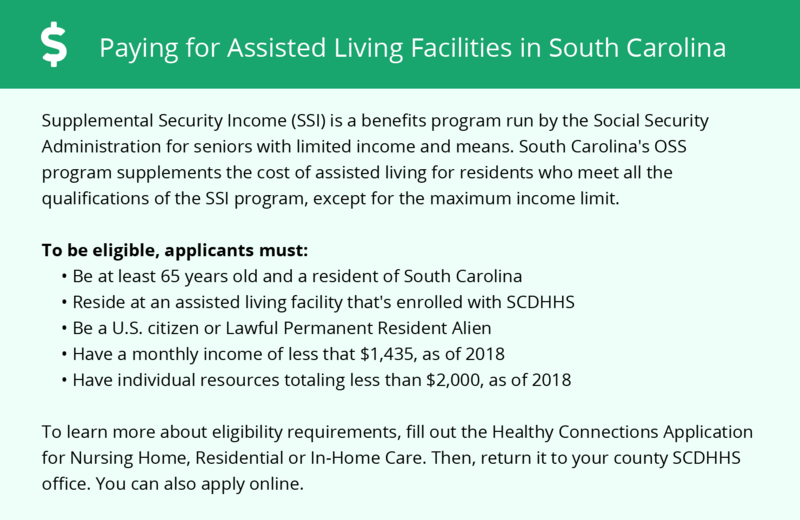 Lexington-area assisted living communities must adhere to the comprehensive set of state laws and regulations that all assisted living communities in South Carolina are required to follow. Visit our Memory Care in South Carolina page for more information about these laws.